What were the most talked-about education stories of 2012? In the past year, experts and practitioners in the field, whole child partners, and ASCD staff have shared their stories, ideas, and resources to help you ensure that each child, in each school, in each community is healthy, safe, engaged, supported, and challenged and prepared for success in higher education, employment, and civic life. These are the top 10 posts you read in 2012. In the 20th century, the United States was the world leader in education—the first country to achieve universal secondary education and the first to expand higher education beyond the elite class. Now other countries are catching up and leaping ahead—in high school graduation rates, in the quality and equity of their K–12 education systems, and in the proportion of students graduating from college. It is not that American education has gotten worse so much as that education in other parts of the world has gotten so much better, so fast. 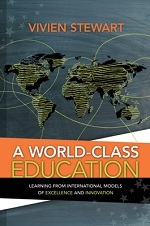 Designed to promote conversation about how to educate students for a rapidly changing and increasingly borderless and innovation-based world, A World-Class Education: Learning from International Models of Excellence and Innovation is not about casting blame; it is about understanding what the best school systems in the world are doing right for the purpose of identifying what U.S. schools—at the national, state, and local level—might do better. Will You Be the Next to Change? This month ASCD relaunched the Whole Child Approach Examples Map. This map, originally launched in August, aims to showcase great schools putting a whole child approach into action. The examples come from not only ASCD—in the Vision in Action: The ASCD Whole Child Award winners and Healthy School Communities mentor sites—but also award-winning schools and communities from many of our whole child partner organizations, including four new worldwide partners. Despite the rumors, school improvement is hard. It's not about a single passionate leader. It's not about "fixing" teachers and teaching or parents and parenting. It's not about poverty. It's not about money. And it's not about standards. It's about all of them. And more. In this column, I'll take on the real deal of school improvement—for all schools, not just certain kinds. And for all kids. Because it's not about quick fixes or checking off the instant strategy of the moment. It's about saying, "Yes, and...", not "Yes, but..."; no matter what our circumstances are. It's about asking ourselves the best questions. One of the great misconceptions of public opinion research on education is that everyone rates the school with which they are most familiar as good and "all those other schools" as bad. Turns out, there is just a smidge of truth to that notion. There are, in fact, good schools everywhere. They exist in every state, province, and country, in every demographic, configuration, and social economic circumstance. And good schools are good schools no matter where they are. Byrne Creek Secondary School, located in Burnaby, British Columbia, is the 2012 winner of ASCD's annual Vision in Action: The ASCD Whole Child Award. ASCD honored Byrne Creek because it is an example of the supportive education community that a commitment to the whole child can create. It is the first Canadian school to receive the award. Vision in Action: The ASCD Whole Child Award recognizes schools that move beyond a narrow focus on academic achievement to take action for the whole child, creating learners who are knowledgeable, emotionally and physically healthy, civically active, artistically engaged, prepared for economic self-sufficiency, and ready for the world beyond formal schooling. March is a special month at ASCD as we hold our Annual Conference and celebrate excellence in education. In the coming weeks, we will honor our 2012 Outstanding Young Educator Award recipient, our ASCD Affiliate Overall Excellence Award recipient, and our 2012 Vision in Action: The ASCD Whole Child Award winner. We'll also spend this month on the whole child website honoring excellence and reflecting on the qualities that make a good school a good school and a good community a good community—even where the context and culture may differ dramatically. Whether your school is in Berlin, Sydney, Ramallah, or Omaha, a whole child approach to education and community engagement—in which each child in each school and each community is healthy, safe, engaged, supported, and challenged—ensures student growth, learning, and development. Daniel Kropf, founder and executive director of the Universal Education Foundation (UEF) and the Learning for Well-Being network. UEF is a Paris-based advocacy foundation that, through its Learning for Well-Being network, works to enhance communities and environments that support children and youth across many countries. With Kropf is professor Marwan Awartani, secretary general of UEF, chair of the Arab Foundation forum, and president of Al-Quds University in Jerusalem. Peter Paulus, lead researcher for the Allianz für nachhaltige Schulgesundheit und Bildung (ANSCHUB—Good Healthy Schools (PDF)), an alliance of schools for sustainable school health and education in Germany. ANSCHUB schools view health as paramount to an effective education and promote the alignment of health, health services, and educational needs of students. Jordan LaPier, senior director of the 100 Best Communities for Young People presented by ING program at America's Promise Alliance. He leads day-to-day operations on the competition, heads up technical assistance and training for applicants, and recruits communities to apply for recognition through the program. Be sure to visit our updated Whole Child Examples Map where you can find examples of schools and communities worldwide that are actively developing learners who are knowledgeable, emotionally and physically healthy, civically active, artistically engaged, prepared for economic self-sufficiency, and ready for the world beyond formal schooling. Each example highlights a program, focus, or achievement with links to more information. A whole child approach to education is not something that is unique to the United States, or even to North America. It is an approach to education that has been taken up by many communities, regions, and countries. It is an approach that understands that education is more than just academic achievement and that ensuring that each child is healthy, safe, and engaged is a necessity if we want to support student growth and provide meaningful challenges to those same students. The five Whole Child Tenets—healthy, safe, engaged, supported, and challenged—are the prerequisites for an effective education that allows students to grow, learn, and develop their full potential.